Is this the first unprompted story written by a computer? 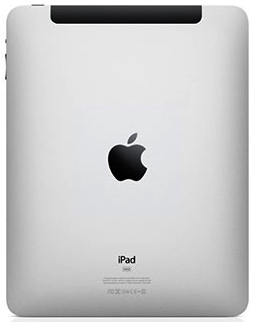 I named it Lopressor for copyright reasons (I want to protect the iPad!). I have waited almost 2 years for any additional text but this appears to be the complete work. This is my challenge to you and anybody else out there: can anybody else produce fiction created by any computer without prompting? If you can’t, I claim this as the first fiction written unprompted by a computer. Drop me a line in the comments below if you dispute my claim! 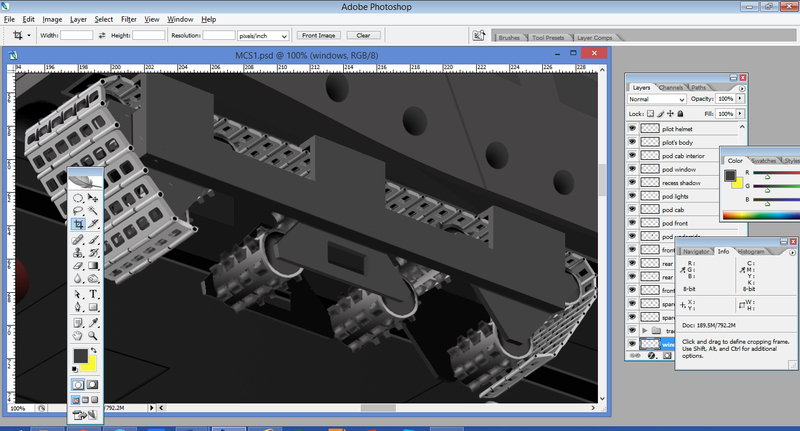 Here is a sneak preview, showing of a cutaway view of the tracked drive system of the MCS Mark 6. Just a reminder: Love Blade Runner? Download the 5★ Science Fiction novel FREE NOW on Amazon until 7 May: http://bit.ly/102Xt92. It’s currently #845 in Amazon Free kindles and #10 in Science Fiction (see screen grab below). If you don’t have one already, make sure you download a copy! Too Bright the Sun is now in the goodread lists: Best Military Science Fiction Books (listed #65) Can’t Wait Sci-Fi/Fantasy of 2014 (#96) and Best Dystopian and Post-Apocalyptic Fiction so if you have time, please vote for it here: https://www.goodreads.com/list/book/17664602 by clicking on the list name at bottom of page and then clicking on the ‘vote’ button beside the book title! I am soon to release World Like Dust, the next part of the Iron Series. 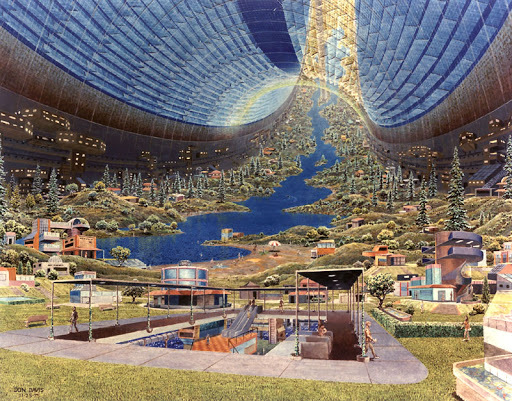 In this episode, the Stamford Torus space station, J5 (looking something like the illustration below) has to leave the Solar System under it’s own power as a final refuge of mankind. I think it should have a new name for this voyage so I want you to choose one. 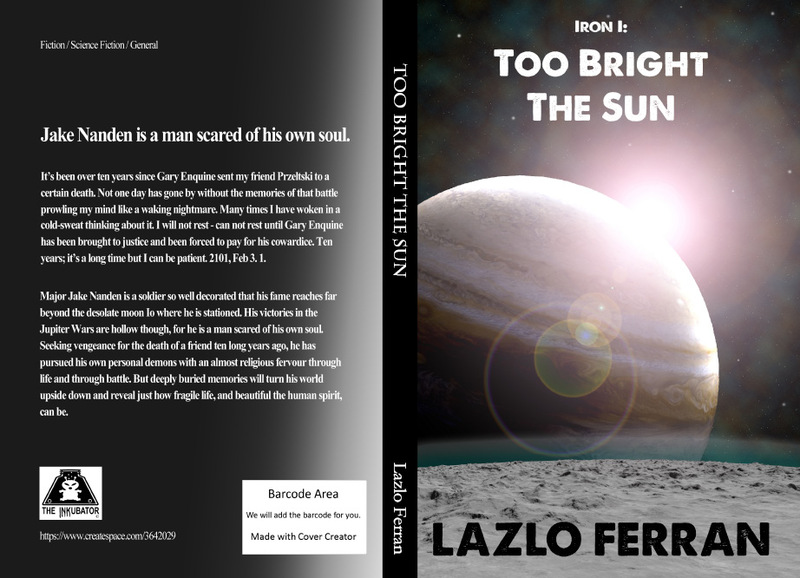 All you have to do is download a FREE copy of Too Bright the Sun, comment here AND share a Facebook post or a Twitter tweet to win the prize of a free copy of Worlds Like Dust. It will be published as two, novel length books so it is a prize worth winning! in addition, your name will be used in the published book and you will also get an acknowledgement at the beginning of the book. Don’t forget, the main difference between the station in this image and J5 is that J5 has a half-scale replica of the Golden Gate Bridge over a half-scale river, where Jake Nanden spent much of his youth. I look forward to hearing your ideas! Good luck! Full marks this week if you knew the film after which this post is named. Since I am back on the story with a working title of Escher’s Staircase, we do have an excerpt this week. Here it is, from a section entitled Painter. All Rights Reserved“I’m sorry, darling,” I explained as I sat down to my cornflakes and honey in our sunny, pine-furnished kitchenette. But suddenly she wasn’t speaking to me. Typical! I don’t know whether to be grateful when she doesn’t pity me or angry because maybe she doesn’t care. On this occasion I was angry. As any man who has been in a long-term relationship with a woman will know, it’s the woman who decides where and when battles will be fought. The only choices I now had were what weapons to use. Righteousness? Jeez, no! Never to be used unless you are absolutely in the sight of God, correct. How about abject repentance. Perhaps worth a try. The old faithful; ignoring her too. Can work but tends to lend righteousness to her argument and prolong the battle. Time is the one thing I don’t have. Okay let’s try this one; the peace-offering from a friend combined with an explanation. Should at least win some Brownie points. “Had a bad dream this morning. Only, not sure if it was a dream at all!” No response. She is still tidying away her own breakfast. Ah, a response. Worth continuing. Faintly, “Oh dad!” is heard. “You could have gone to the door! The neighbours will hear!” Christy muttered. “When are we going to tell him?” I had to count to five after this one. Every chance she gets, she asks this and she knows the answer. “Oh, don’t be stupid. I will even love your corpse.” Ouch. Now, I’ve really dug level two through to ten of my hole. “Sorry, baby. I didn’t mean that.” I stood up, went around the table and put my hands around her stomach. I kissed her neck and she tilted her head obligingly. How does creativity work for a writer? Often get asked that question. There is no simple answer. Like a shaman, do I summon from the murk something to make shine bright? Yes, in a sense I do. But the process by which this (hopefully) happens varies. My best time of the day for ideas is about 10.30-11.30 am. I usually spend about a year developing a story from a germ of an idea to an actually story outline. Very often I will abandon an idea very early on. So in the early life of a story, I am often spending a lot of time in the morning thinking about it. Afternoon and evening seem better for simply getting things down. While I was still working full-time in the IT industry, evening was usually the only time of day available for me to writer. Very often, I could only manage one hour or so after eating before my focus would be completely gone. However, my writing is almost always cathartic. I don’t pretend it isn’t. For me this seems to mean that I have a very considerable resource of creativity. I won’t say it never runs out but it rare that I don’t feel like writing. I was a very angry child. ‘Cathartic’ means I don’t really have much control over it; the quality varies. Obviously, if I could I would write only my best stuff all the time but the very best comes only occasionally and usually when I am ‘in the zone’. Usually I have to accept writing quite a bit ‘in the zone’ before I will recognise that I have written one or two good phrases. Sometimes I don’t even see them until I read it back for the first time. Sometimes good passages are born of desperation: I will be trying to write and thinking it’s rubbish and something in my mind just takes a leap into the unknown and comes up with something good. I think accepting that one has to write a lot of stuff that is very good rather than ‘inspired’ is one of the hardest aspects of writing. I don’t think anybody can be great all the time so one just has to keep working on one’s technique to make sure the good stuff is very good. Then the great stuff might be really great! I have finished the firsts draft of Iron III: Worlds Like Dust. Expect to see this out some time late this year. At the moment two people are reading the draft so they can feed back to me on the general story structure. You can now also dream up your own film cast for my books on storycasting.com. I have put together my own cast so why not sign up today and have a go. I am witnessing a strange phenomena right outside my window. We live above a park and in the last few weeks Polish migrant workers have started sleeping in large groups under my window! For some years now Polish construction workers have come to my area because of large Wickes and B&Q branches here. There have been articles on news programmes showing these workers waiting outside these branches early in the morning waiting for a builder who needs casual labourers for the day. Polish men are renowned as hardworking builders who work to very high standards. That’s why I am pretty sure these are migrant workers looking for building work. But why have they nowhere to live. The night before last there were thunderstorms all night and they stood under trees as long as they could before running of somewhere. Last night, again it rained and they had to sleep through it under blankets. They haven’t even got sleeping bags. This morning my girlfriend and I gave them a loaf of bread. It bothers me that nobody is concerned about them. I thought now that Poland was part of the EU, we would have more of an obligation to watch out for them. During WWII we could not have won the Battle of Britain without these tough, brave men. There is something else that bothers me. Last year the news programmes told us that now the UK was in recession Polish migrants were returning to Poland where wages were rising in comparison with the UKs. They are back. I guess that’s because we are slowly climbing out of recession. But before, when they came, they never slept in the park. What’s changed? Is it just the Government? As you will see in the post below, I was very happy to find out today that Too Bright the Sun entered the Top 100 FREE Kindle books list on all three: Amazon US, UK and Canada on Monday. Promoting my work takes me away from writing so it’s really nice to get some reward for all the effort I have put in over the last few weeks. I only wish I knew exactly what number it reached. You can rest assured I am watching the progress of Vampire: Beneficence (Short Stories III) very closely. Below I will discuss the results of the Amazon KDP Free Promotion for my books so far. It’s languishing around the 3000 Ranking on both Amazon US and UK so if you haven’t downloaded a copy, please do. Interestingly, I did a two-day paid advert for 29-30 June on Facebook for this and I think it made very little difference. 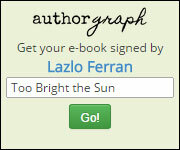 There have been 103 downloads (the promotion is now finished) which is about half what Too Bright the Sun achieved. But then Amazon continued billing me for half of the 1st July before I could stop the advert!! Needless to say that I have complained to Facebook about this but have not heard back. Their promotional blurb is misleading if this is how the promotion works: you have to delete or pause a campaign to stop them from billing you after the campaign is due to finish. I am also waiting for reply to my complaint about having the link to Too Bright the Sun declared spam! There was only one option from drop downs for the complaining email: ‘my Human Rights have been violated’! Anyway, in that 2.5 day period 168,500 people were reached and there were 52 clicks giving a ‘conversion’ rate of 0.005%.However it doesn’t mean these 50 people downloaded copies. I am doubtful many of them did because if I look at the access statistics for my Lazlo Ferran page I see that I reached 97,000 people in India in the last month (the highest reach for any country) followed by Germany at 44,000, Uk at 31,000, Canada at 20,000 and US at 15,000. And yet I only had 5 downloads from India. It is however worth noting that the high number reached in Germany might explain why the downloads for Germany were so unexpectedly high. I haven’t paid for an advert for the Vampire book and downloads are soon to exceed those for Unknown Place, Unknown Universe. I decided to do a caption competition half way through Too Bright the Sun’s promotion and had some great suggesions. The winner for the Alien Laser Rifle is Organic Plasma Rifle by Dominic Kay @DBCK83. The winner for the laser pistol is Laser Carbine LC5150 ‘Bullpup’ by David Bayne @david_bayne. The names will be included in Iron III: Worlds Like Dust and of course there will be a credit both winners! I have added some more background information and pictures in a section ‘From the Author’ for both Iron Series books; Too Bright the Sun and Unknown Place, Unknown Universe so be sure to take a look by clicking on the menu above. Also if you are a writer and interested in lycanthropy or high tech science fiction please join my discussion group on Facebook. Don’t forget, the Free Promotion of Vampire: Beneficence: (Short Stories III) is still FREE to download until 8 am Sunday UK time or midnight 6 July in the US.